Sorry, Set of Six Painted Faux Bamboo Metal Hangers is not currently available. Faux-bamboo gilt-metal magazine or newspaper rack in great vintage condition. Rack still has the original makers metal MADE IN SPAIN tag. Strike up the band with three amusing, folky painted metal elephants singing and drumming in gay attire with a rustic oxidized finish. Brass faux bamboo planter, probably French, circa 1950s. Retains it's warm original patina. French Victorian large faux wood painted metal jewel box with bronze doré trim and center frame. 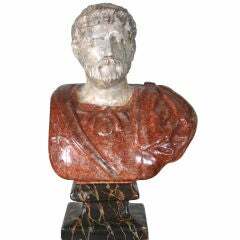 A late 19th-early 20th century carved faux painted bust of a Roman Emperor.